There are several different ways to tenderize meat with either spices, tools or techniques but the most common way is to use the best meat tenderizer. A meat tenderizer tool or mallet will not only tenderize the meat but will also help shape and flatten it as well. A meat tenderizer is mainly needed for extra tough cuts of meat like roasts and any of these methods will work. The meat tenderizer will help to soften up the meat as well as prepare it for marinating. There are some meat tenderizer tools that will cut deep holes into the roast as well making it optimal for marinating anything. In this article we will talk about the different kinds of meat tenderizer tools there are as well as what to look for when purchasing a new product. We will also cover some of the meat tenderizers available on the market for purchase today. There is not a lot to look for in meat tenderizer when it comes to a mallet. Yes, there can be some advantages with some models but for the most part, those types are all very similar and quite durable. Just make sure to get one that is strong and made of quality materials. There are other types of meat tenderizers other than mallet that work the same way a stapler works but with many blades within the tool to penetrate the meat all at once. These tenderizers are for larger roasts and things that are intended for marinating or brining. There are also machines that are similar to meat grinders but instead of grinding the meat, the blades only pierce the meat as it passes through the machine. These machines are not all that common and simply unnecessary when it comes to this easy task. Whichever you choose, make sure the product is constructed of high-quality materials and is very easy to use. For mallets, make sure there is a grip on the handle to protect your hand from blisters when you need to tenderize a lot of meat at once. The design of meat mallet has really not changed all that much. There are basically two different designs and either will work well. The first is in the shape of spatula but much heavier. The other is the traditional square head mallet. It just depends on your preference here. Either one will get the job done efficiently. The multiple bladed meat tenderizers are also all very similar in design and there is not much room for improvement so the market is tough competition. You just want to make sure that all the blades are contained within the tool when it is in use to prevent any accidents. The machines, otherwise known as “Cubers”, are all the same design as well. They are a little bit bigger and will take up much more space than you think. It’s not really a pretty kitchen appliance display. Just store it with the kitchen aid and the meat slicer in the cabinet and use when it is needed. The construction of the meat mallet is pretty simple and self-explanatory. You will want a high-grade solid metal mallet with some grips to prevent slipping and protect your hands from blisters. A meat mallet with different textures on the head of each side also comes in handy for using different applications on meat. The meat tenderizer tools are basically a strong small box in the shape of a mailing address stamper, with 20-100 small blades contained inside. Think of the small blades inside as several tips of boning knives pressed together all puncturing the surface at once. Making sure the blades are high-quality metal and won’t break, wear own or lose their sharp edge over time through using it. These types of meat tenderizers get the job done quickly and with little to no work involved. It is often said that a Jaccard meat tenderizer tool beats all other meat tenderizers every time. A warranty will help to protect your meat tenderizer when it breaks. Most quality manufacturers offer a lifetime warranty with their products because they are confident it will last forever. However, most meat mallets are fairly solid and hard to break so in some cases the warranty may not be all that necessary but is always important to have just in case. If the product does not come with some sort of guarantee or warranty then it is pretty clear that is a red flag and should not be considered as a reliable product that will outlast the test of time. We start off the list with the best meat tenderizing tool also known as the Jaccard. This instrument pierces the meat with 48 razor sharp blades. The tool is best used on tougher and cheaper cuts of meat such as roasts. The Jaccard meat tenderizer is able to deliver a 600% increased absorption rate and will also cut the cooking time down by 40%. The blades penetrate the meat up to 4 inches deep and completely even across. The handle is made from abs hard plastic and is also equipped with a storing case. 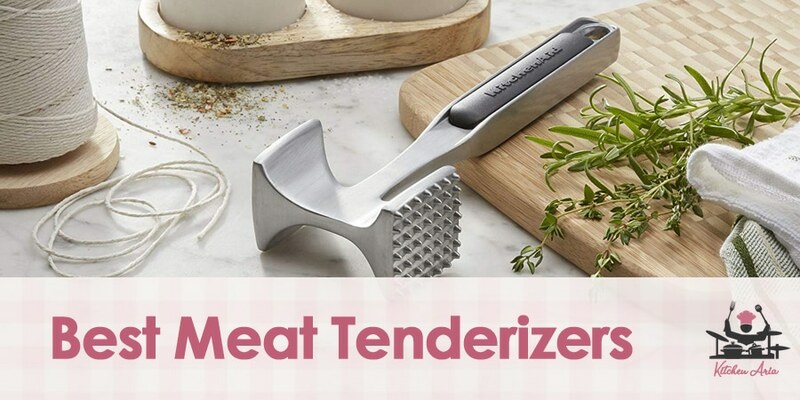 This may be the best meat tenderizer tool but it does not come with any kind of warranty to protect it from damages or defects that may occur while in use. Although the Jaccard meat tenderizer is very inexpensive on the plus side. Has the ability to raise the absorption rate by 600% when applied to roasts for marinating. Can cut down the cooking time of roasts by 40% when applied properly. Does not come with any warranty to protect it from defects or damages that may occur while in use. Here is a very basic model of a meat mallet. It would work best in any home or kitchen where it will not get as much use out of it. On the downside, this mallet is not all one solid piece which means it could fall apart over time, good thing the price tag on it is very low. The mallet features two sides on the head, one smooth surface for pounding and one textured surface for tenderizing. The mallet is attached it a comfortable, soft contoured handle that is easy to grip and is slip resistant whether it is wet or dry. The meat tenderizer mallet is also dishwasher safe. There however is no warranty to protect it from any damages or defects that may occur while in use. And in this case, this mallet may fall apart. But it is very cheap and that may justify the mallet itself. Has two sides on the head of the mallet, one smooth surface for pounding and one that is textured for tenderizing. The mallet is attached to a soft contoured handle that is easy to grip and is slip resistant. The meat tenderizer is also conveniently dishwasher safe and very affordable. The mallet is not all one solid piece which may have the tendency to wear and fall apart over time if used often. The mallet does not come with any warranty to protect it from damages or defects that may occur while in use. If you don’t want to pound away on your meat all day like you are hammering nails then you may want to look at this product. It is still in the category of a meat mallet but is designed as a stamp rather than a hammer. The meat tenderizer stamp is made of stainless steel that is solid with an easy to grip handle. The handle is also interchangeable with 2 different stamps that attached to it. One is a heavy smooth surface for pound or flattening and one is spiked to apply tenderizing techniques. The mallet is still under twenty bucks but there is no warranty to protect from any damages or defects that may occur while in use. That may happen with this model as well because it is not one solid piece. Meat mallet is designed as a stamp rather than a hammer for tenderizing meats. The mallet is constructed of solid stainless steel with an easy to grip handle. Comes with two different attachments, one flat surface for pounding and one for tenderizing. The mallet is not one whole piece which could price to be problematic over time. There is no warranty to protect it from damages or defects that may occur while in use. This meat mallet is designed with the classic look and construction. There are many like this that are all one solid piece but this one has a trick up its sleeve. This mallet is only 10 bucks and has everything you could want in a mallet. It is constructed on solid aluminum to create a strong and lightweight body for easy handling. There is also a loop hole at the end of the handle for hanging or storing. The handle has comfortable inlays that are slip resistant. The head consists of two different surfaces, one for tenderizing and one for pounding. The only negative thing about this product is that it has to be handwashed. But that doesn’t matter because this mallet comes with a 1-year warranty to protect it from any damages or defects that may occur while in use. This meat mallet is a little bit too much in terms of force. The mallet is equipped with an extra-long handle to provide an extra amount of leverage while pounding or tenderizing meat. The head of the mallet is constructed on stainless steel that is plated in chrome to make washing much easier when it is placed in the dishwasher. The head has two different sides of applications, one smooth side for pounding and one side that is textured to provide a tenderizing effect to meat. The head is attached to an aluminum handle that is coated in a soft rubber that is easy to grip and slip resistant. While the mallet will get the job done, it is not all one solid piece which could prove to be problematic in the future. It is also not covered by any kind of warranty to protect it from damages or defects that may occur while in use. The head is constructed of stainless steel that is coated in chrome to make cleaning easier. The product is also easy to handle and dishwasher safe. The meat mallet is not constructed of one solid piece which may mean it could be prone to damages after continued usage. The meat tenderizer mallet is not covered by any warranty to protect it from damages or defects that may occur while in use. This is almost an exact replica of the Jaccard meat tenderizer tool. It looks very similar in shape to the Jaccard and also has 48 razor sharp blades that are able to pierce roasts up to 4 inches in depth. This model differs from the other because it has a handle on top on the meat tenderizer tool that makes it easy to handle. The tool is also dishwasher safe making it easy to clean. However, the product is quite expensive compared to the Jaccard and there is also no warranty to protect from any damages or defects that may occur while in use. The Jaccard is actually cheaper and a much better product. The meat tenderizer tool is constructed of 48 razor sharp blades encased in hard plastic that are able to pierce roasts up to four inches deep for preparation of marinating. The tool is equipped with a handle at the top to make handling the meat tenderizer easier. The meat tenderizer tool is dishwasher safe. There is no warranty to protect it from any damages or defects that may occur while in use. The product is a complete knock off of the Jaccard meat tenderizing tool and is actually more expensive as well. This machine is a little different than what we have been showing you. This is an actual crank operated machine that works just like an old school meat grinder, to tenderize any cut of meat you prefer. The machine is constructed of solid cast iron and is coated in a food-safe coating. There are 32 inner blades that pierce the meat as it passes through the machine. The machine stands up very sturdy with a heavy and string base. The machine also comes with a pair of stainless-steel tongs to help in the process of tenderizing the meat. However, the machine does not come protected by any kind of warranty and it needs to be cleaned by hand. Not to mention it is 10 times more expensive than most meat tenderizing tools and is also 10 times the size and weight. Seems like a little outdated compared to what else is available for purchase on the market. The machine is made of solid cast iron that is coated in a food safe coating. The inner workings of the machine are 32 razor sharp blades that pierce the meat as it passes through the crack operated machine. The machine comes with a pair of stainless-steel tongs. Does not come protected by any kind of warranty. The machine is very expensive, very heavy, much larger than other tools. This is a very outdated type of meat tenderizer. This is also another take on the Jaccard meat tenderizer tool except it has been constructed in a circular shape to fit in the hand easy. However, there is no slip resistant coating on the handle so it could be dangerous. The tool is equipped with 52 razor sharp blades that will penetrate the meat up to 3 inches in depth. There is also a child proof lock on the tool and a plastic casing surrounding the blades for other protection. The tool is also conveniently dishwasher safe and very affordable as well. The tool is constructed of 52 razor sharp blades to penetrate the meat up to 3 inches deep. The meat tenderizer has been designed in a circular shape to better fit in your hand. There is childproof locks and the tool is also dishwasher safe. There is no warranty to protect the meat tenderizer tool from any damages or defects that may occur while in use. The handle has no protective or slip resistant coating which could be dangerous while in use. And last but not least we have a very formidable meat mallet for tenderizing. The mallet is constructed of solid aluminum to provide strength in the mallet as well as a lightweight for the user. The mallet is only used for tenderizing and not pounding as well. There are two sides on the head, one textured for tenderizing and one that is spiked for deeper cuts for marinating. There is also a loop hole on the end of the handle for easy storing or hanging. The meat mallet is dishwasher safe, very affordable and also comes with a 5-year warranty to protect it from any defects or damages. Whatever meat tenderizer you decide to go with at least make sure it is reliable. Make sure you are comfortable using the product as well. There is no point in buying something you don’t know how to use or are unable to use. And again, there are many different types of meat tenderizers so make sure to buy the correct one for the right procedure. Now get up and get yourself the best meat tenderizer today!